Chase after The Joker’s super-cool Mighty Micros ice cream truck with Nightwing™! Intercept the clown prince of crime and attack with the baton. Grab the ice cream from the truck’s trunk and get away. Then chill out, but beware of eating the ice cream—it might be poisonous! 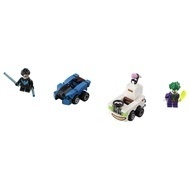 - Includes Nightwing™ and The Joker™ minifigures with mini legs. - Nightwing’s Mighty Micros car features a rear wing and transparent windshield elements. - The Joker’s Mighty Micros ice cream truck features an opening trunk with an ice cream element inside, smile decoration and translucent-green headlight elements. - Also includes Nightwing's 2 Escrima Sticks. - Multiple Mighty Micros sets to collect, including 76092 Mighty Micros: Batman™ vs. Harley Quinn™ and 76094 Mighty Micros: Supergirl™ vs. Brainiac™, for even more battle fun. 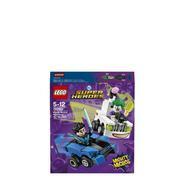 - This popular superhero toy for kids is suitable for ages 5-12. - Nightwing’s car measures over 1” (5cm) long, 1” (4cm) wide, and under 1” (2cm) high. - Ice cream truck measures over 2” (6cm) high, 2” (6cm) long and 1” (4cm) wide.